Travelling for good eats is by far one of my favourite things to do! Exploring the diversity of cuisines and flavours in different cities make for a different adventure, each and every time. I’m often asked how to travel and eat well, while maintaining a low daily spend. It’s not that hard actually – the most important tip I provide is to research your destination, look up popular eats and must eats, and plan accordingly. But my favourite way to economise, yet splurge on amazing foods are culinary food festivals. 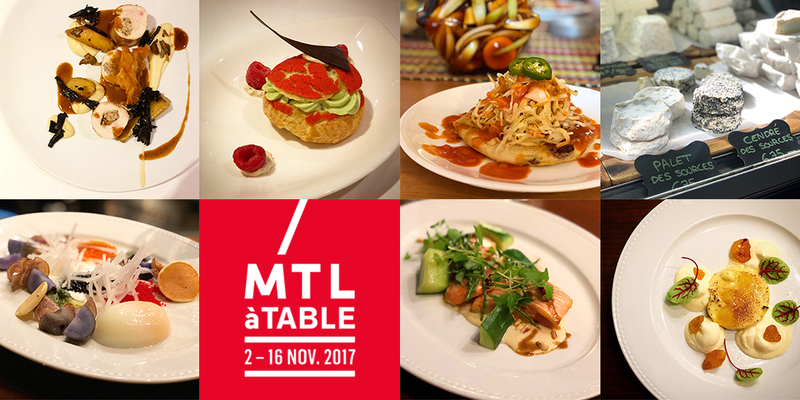 Montréal’s MTLàTABLE is currently in it’s 6th edition and runs from November 2-16, 2017. What does this mean for you, you can go and try out some of Montréal’s best dining establishments, featuring 3-course fixed-price menus in three different pricing categories, $21, $31 or $41 for dinner and $15 for brunch. Another aspect was the inclusion of guided culinary tours which are always a great way to learn more about the culinary scene of your destination. This past weekend I made the road trip to Montréal to experience this amazing festival for myself. I made all of my reservations a week before going and I suggest you do the same as the restaurants do book up fast! For my first dinner, I chose Restaurant Renoir, $41. Renoir is a highly rated restaurant located in the Sofitel Montréal and serves French classics and classics with a twist. The MTLàTABLE menu featured savoury creations by Chef Olivier Perret and amazing deserts by pastry Chef Roland Del Monte, MOF. 1st course: Chicken liver cake with port sauce. 2nd course: Chicken breast stuffed with wild mushrooms. Celery root & parsnip purée. 3rd course: Pistachio Raspberry Chouchou. The dishes and service were excellent. Besides eating, the next most important thing is sleep. I had the opportunity to stay at a hotel that wasn’t previously in my repertoire although it had been on my radar for a while. Hôtel le Crystal is a luxurious 5-star establishment and one of the most unique of its kind. The hotel is stylish and lavish. The king suite was perfect and allowed me to rest in comfort for my next big day! I also had the opportunity to eat breakfast in La Coupole Bistro Laurentien which is located at le Crystal and is also part of the MTLàTABLE as well! After breakfast I headed to the Jean-Talon Market area to meet-up with the tour guide of my culinary tour entitled “Beyond the Market”. This tour is offered by Spade & Palacio, a tour company that differs from commonality and offers “non-touristy” tours and are lead by locals showing their side of the city. My tour guide was Anne-Marie, co-founder of this business and she was great. Her passion for the city of Montréal is real and she lets it be known. We had the opportunity to stop by some very cool hot spots featuring many different things from pupusas to ice cream and coffee to beer. The three-hour walking tour kept our group moving, warm and tummies full. If you haven’t seen the food scene in Montréal, one of these tours would be perfect for you! I then checked-in to my next hotel, the Intercontinental Montréal. Luxury – is a great descriptive for this property. There is no lack of attention to any detail here. A quick nap was in order prior to dinner. My king suite was well appointed, and the bed was extremely comfortable. A quick walk north and I arrived at my second dinner location, Notkins, $41. Notkins is a seafood restaurant, bringing in only the freshest from the sea and specializes in amazing seafood platters and fish. I had the opportunity to sit at the oyster bar and watched hundreds of oysters, clams, scallops and more be cracked from their shells and presented on beautiful platters. Clearly these platters aren’t part of MTLàTABLE due to the market value of seafood these days, but their menu is without a doubt, one of a kind! These dishes were well thought out and were very different. Service was excellent, and it was great chatting with Thomas, who was preparing the seafood platters in front of me. He exudes passion and confidence for his trade – it’s always good to meet young and aspiring chefs that love what they do! The next morning, I had breakfast at Osco! located in the Intercontinental Montréal and, another MTLàTABLE restaurant! Needless to say, this food festival offers anyone and everyone options that will fit into your budget and since the prices are so affordable, the drive from Ottawa to Montréal to experience this is definitely worth it!